While visiting friends in Cochrane, Alberta, we had to make the difficult decision of how to spread out our limited time in Canada. I recall when we lived in Yellowstone shaking our heads each time a visitor came into the park with a few short hours to spend. We wondered if it was worth the time to visit when so much would be missed. Here we were faced with a similar decision, during peak tourist season, and I found myself as excited as those first-time Yellowstone visitors, wanting to see it all. We were so close to many national parks so of course I wanted a taste of as much as possible, rationalizing that we could always return for more. Our first stop was Banff National Park, in the Alberta province, where we pitched our tent for three nights at Lake Louise campground. 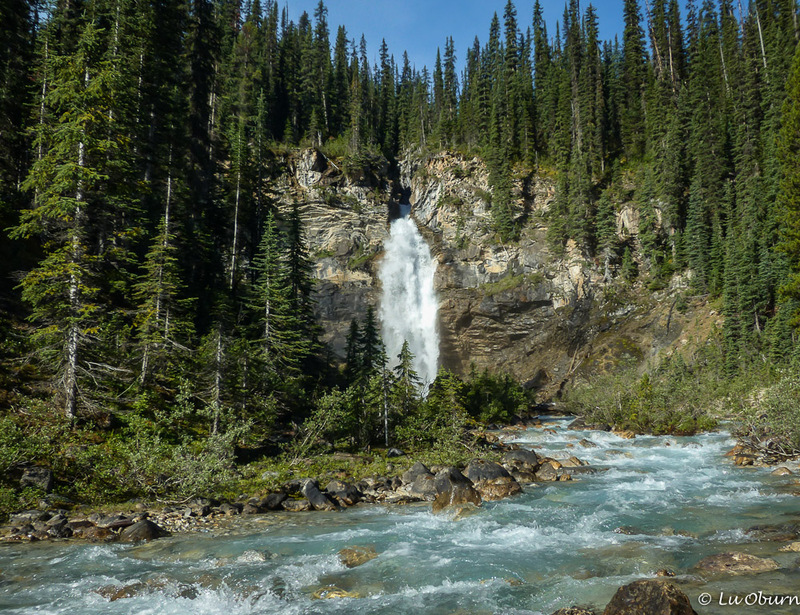 What began as a 16 square mile hot springs reserve is now 4125 square miles of unparalleled mountain terrain, Canada’s first National Park, home to seven National Historic Sites. Banff, along with Jasper, Yoho, and Kootenay National Parks is recognized as part of the Canadian Rocky Mountain Parks UNESCO World Heritage Sites. Ok bear, here I come! I thought our western mountains were breathtaking, but Canada really takes it up a notch with their Rockies, a beautiful melding of heaven and earth. There is an unspoiled “wild-ness” here, thanks to the ice-age glaciers acting as landscape sculptors, creating the rugged mountain ranges and gouging out the valley into a deep basin. The glaciers that covered the Canadian Rockies have vastly retreated but have left behind vivid memories found flowing in the turquoise and jade green waters, unusual gorges and canyons, and unique rock formations. The next morning we set out for the much smaller Yoho National Park, in the province of British Columbia, and the second Canadian National Park. 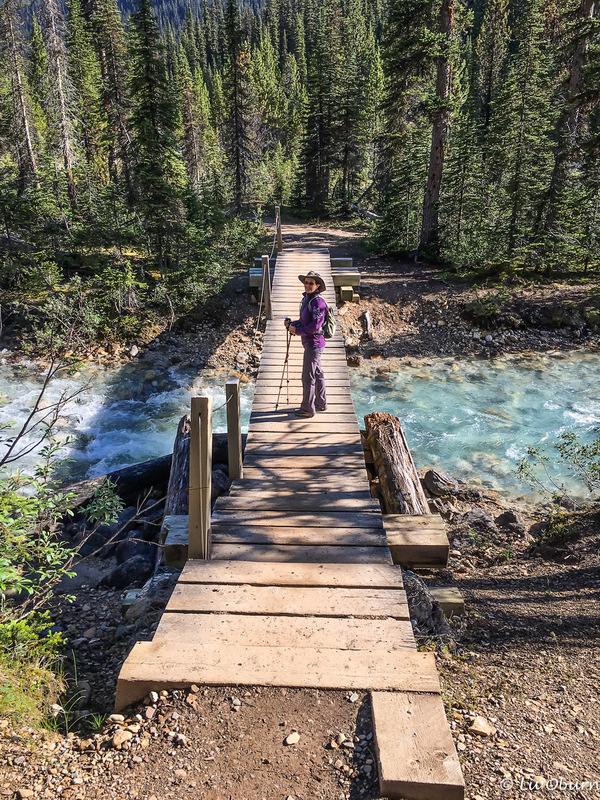 The unusual name for this park is a Cree expression meaning awe and wonder, which was exactly what we were feeling throughout our first hike in a Canadian park. 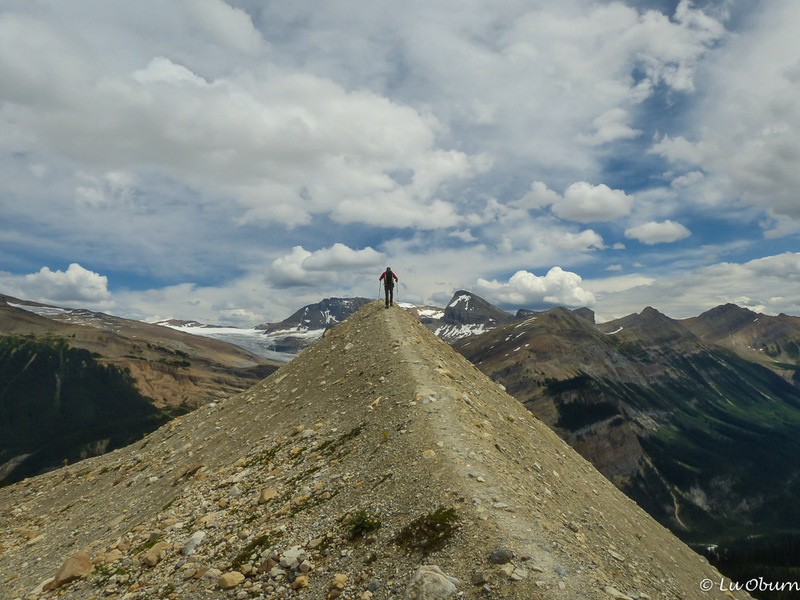 Although the smallest of the four parks that form the Canadian Rocky Mountain Parks UNESCO World Heritage Sites, it holds some of the oldest and most significant shale fossil beds in the world, as well as 36 peaks soaring above 10,000 feet. It packs a punch! The Iceline Trail via Little Yoho (the big loop) is 13-miles, with many of those above treeline. 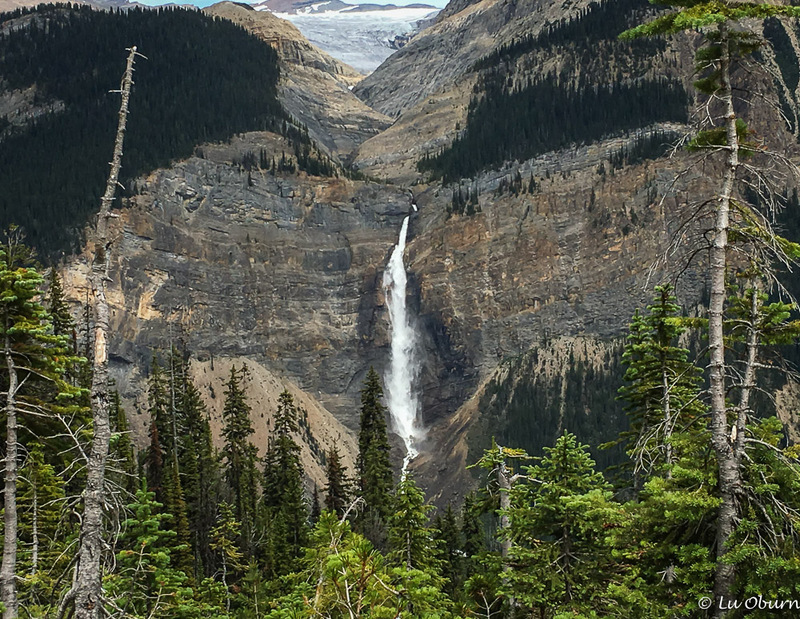 It’s roughly 3000′ of elevation gain made for a challenging hike, but the 360º views of glaciers, flowing streams, and one of the tallest waterfalls in all of Canada made it worth the effort. One of the infamous red chairs found after completing the Iceline Trail. 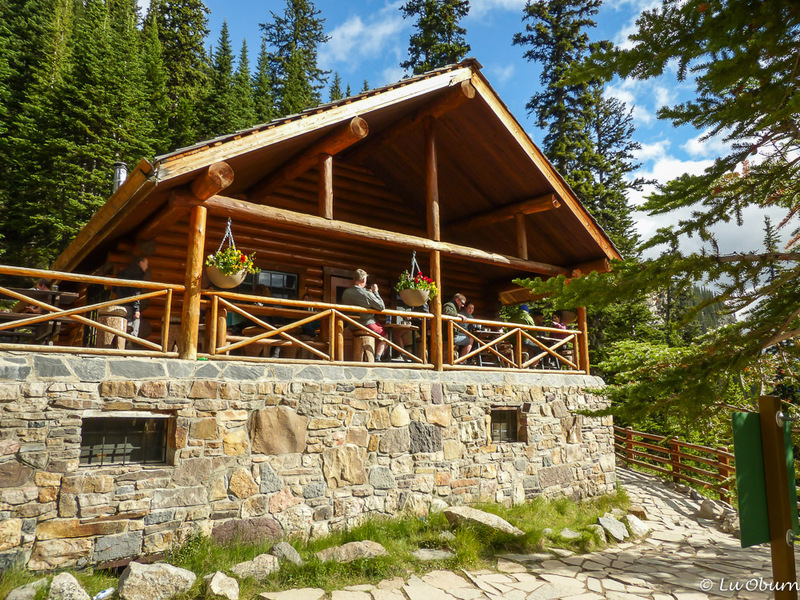 The next day we decided to scale back our hiking and chose to hike the Lake Agnes Trail in Banff National Park to a European-style tea house, the highest tea house in all of Canada. It is probably the most “civilized” way to see the Rockies. The trail is 4-miles round-trip, with a 1300 foot elevation gain, just enough for me after our previous day’s trek. And a visit to Banff is not complete without visiting the most iconic site in the park, the emerald waters of Lake Louise, where millions come every year to bask in her beauty. It is the most famous glacial lake in the Canadian Rockies, named for Princess Louise Caroline Alberta, daughter to Queen Victoria. 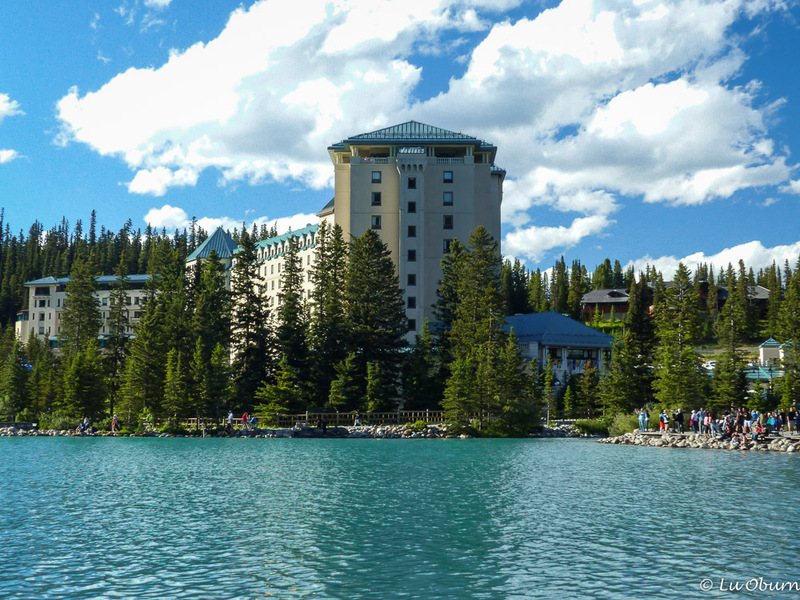 The world-famous Fairmont Chateau Lake Louise sits on the edge of the lake, striking an impressive pose. And it looked like millions were there on the day we visited and none spoke our native tongue. Sounds like you packed a lot into a few days. Such beautiful country. Perhaps one day Don and I will go exploring in our own back yard. I’ve been to Banff and Yoho, but only to drive through – not the same as hiking. That opening shot is a beauty, and also the one of Terry alone on that narrow trail. It isn’t the way we like to travel but I knew we were close enough to get back for further exploration. I’ve lived in several places where my back yard has been left unexplored…funny that. Spectacular scenery and great captures LuAnn. Since we will be there in a few weeks, I can’t wait to see for myself these gorgeous place. I’m sure you will have more time and hopefully the crowds will have diminished by then MonaLiza. I’m surprised you haven’t been already Andrew. Haven’t been that far north, mostly I head south. Got to go the other way once in awhile. My wife and I went to Yosemite in the winter a few years ago – it was wonderful. Awesome places. Great to read about your time there. I didn’t get to do much hiking there, so I’m a little jealous. Great pics, too! The Canadian parks are spectacular. I know that there will be a repeat visit in my future. 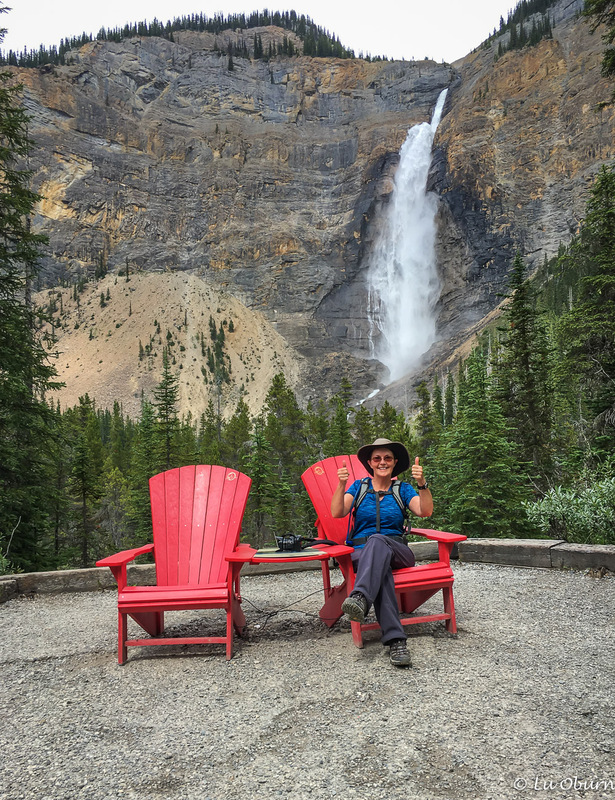 Yes, the Canadian Rockies are spectacular and you captured some beautiful photos to prove it! Although we didn’t take the long hikes you did we made several scenic drives and never stopped being amazed at the scenery. It is truly amazing, isn’t it? What beautiful pictures, LuAnn. Your pictures, for sure, make people want to go there. I hope I can make it up there, some day. I’ll have to work really hard, to do some of those hikes, however. I love that very tall waterfall. Thanks for making me drool. I did not want to leave Canada and I am already talking to Terry about a return visit. Although we didn’t get to do much, what with timing and a weather front moving in, I’m still glad we got to experience it for a short time. The fall would be a beautiful time to be there. The lakes have such brilliant colors due to the glacial silt. I could stand and gaze at them all day. I’ve never even heard of Yoho National Park, but now I want to go! We hadn’t heard of the park either until a friend told us about the Iceline Trail. When we were trudging above the treeline for miles on a rocky surface, I heard a voice behind me say “what are you trying to do to me?” I think I’m keeping him young. He thinks I’m vying for a 3.0 model (haha). What a waterfall scene you captured there! That is the pick of a fantastic crop of photos but that is par for the course with you my friend. It’s refreshing to see such beautiful places and even better to know that people are actively celebrating them as well. That would be wonderful. I have heard that fall in the Canadian Rockies can be a bit iffy, but Pam and John found it to be wonderful. They did get snow in Jasper, but I believe it was just in the mountains. I may have to ask my friend Sue, who lives in Calgary, her thoughts on the matter. We have never been to this gorgeous part of the country and probably never will. We have friends there right now. Between you two posting such awesome photos, we have an excellent idea of the scenery. I know it isn’t the same as being there though. I love photos of the glaciers. They’re so tall and strong and massive. I feel so insignificant just looking at them. What a fantastic hike. You too don’t shy away from challenges that’s for sure. My favorite photo is you I the famous red chair. The waterfall behind you just makes that a perfect picture. I know what you mean Marsha. There are so many places we want to visit and probably never will so I have to content myself with drooling over others’ photos. Standing in front of the glaciers, I feel so small. It is sad to think that in a relatively short time they may all be gone. We loved our short time there. It has whetted our appetites for a much longer visit. Looking forward to our fall trip together. I’m from ontario can.and live in new Brunswick can.and I just love the eastern life it’s just beutiful place to live. It was truly beautiful. I hope one day to visit your little neck of the woods. Terry raise you left eyebrow in your next photo if you are being held against your will. And remember, it’s nothing to be ashamed of if a man admits to abuse. I agree the Canadian Rockies are fabulous. We took our kids when in High school skiing in that area. Staying in Banff and taking a bus to the different ski areas. Lake Louise Resort was our favorite. It has a ski lift called ‘top of the world’ that is breathtaking when it crests the mountain. We would love to see it in the summer. Thanks for the tour. I would love to go back in the fall. Hope you and John are having a good summer. Spectacular scenery well captured that makes me go there now. Once again I enjoyed your giving us a peek of what to expect when our turn comes. Can Betsy be driven there or is it best driven in a small car? Betsy will have no problem and she would enjoy the views as well. The only problem you could encounter, but I doubt it, is at the Columbia Icefields Centre, should the parking lot be full of travel buses. There were lots of buses when we were there, but I still think Betsy would have been just fine. you need someone to cook for you? Indian light food? I have to believe it would be spectacular in winter!